Are your children always hoping to receive something when you get a package in the mail? Do they ask whether everything is for them when you're crafting? 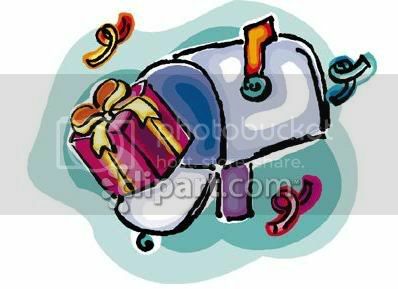 Now is your chance to receive a package in the mail just for your child, filled with the things he or she loves! Feel free to sign up for younger siblings, nieces, nephews, or any other child in your life who would love a package of goodies. This is going to be a 5 point swap. That means you can make a large and a medium, a large and two smalls, two mediums and a small. one medium and three smalls, etc. There is a list floating around here somewhere about what qualifies as small, medium and large if anyone is having trouble. For this swap you can decide if you want 1, 2 or 3 partners. New swappers are limited to one partner. You will not be sending to and receiving from the same partner(s) because I'm going to match everyone up as best I can on desired crafts and whether you want to craft for a boy or girl. Please remember to PM me with you questionnaire. Don't reply in the thread with your answers. Everyone please remember to PM me when you send AND when you receive. Please take pics when you receive, or communicate with your partner if you can't take pics so she can take some before she sends. It is probably a good idea to take pics before you send, just in case. Action shots are strongly encouraged! I'm definintly going to keep my eye on this swap. Most people I have swapped with toss in something extra for the kids anyways, but for them to get something totally all for themselves would be wonderful. And the send out date is half way between their birthdays and Christmas..... Lol see me talking myself into it? I sent in my questionnaire. i love the growing collection of handmade goodies that Aria is acquiring! It 'll be fun amassing more!! It is lovely to have you rlynn, as well as the rest of the ladies who have signed up. I have a feeling this is going to be a great swap! Of course, I'm a little biased. My daughter will be 2 in October. Is she too young for this? I think it would be a great way to get some unique, handmade gifts for her birthday, and I would like to try crafting for kiddos too! Thanks for letting me join. Can't hardly wait to get started -- going to be so much fun!! She is not too young at all! I'm signing my daughter up and she will be 8 months old at send outs. I really want to sign up for this one.. I'll have to hurry up and finish my other 2 swaps before signing up for this one.